“FTZ” redirects here. For other uses, see FTZ (disambiguation). The World Bank defines free trade zones as “in, duty-free areas, offering warehousing, storage, and distribution facilities for trade, transshipment, and re-export operations.” Free-trade zones can also be defined as labor-intensive manufacturing centers that involve the import of raw materials or components and the export of factory products, but this is a dated definition as more and more free zones focus on service industries such as software, back-office operations, research, and financial services. Free-trade zones are referred to as “foreign-trade zones” in the United States (Foreign Trade Zones Act of 1934). 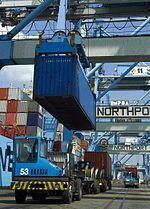 In the United States, FTZs provide Customs-related advantages as well as exemptions from state and local inventory taxes. In other countries, they have been called “duty free export processing zones,” “export free zones,” “export processing zones,” “free export zones,” “free zones,” “industrial free zones,” “investment promotion zones,” “maquiladoras,” and “special economic zones.” Some were previously called “free ports”. Free zones range from specific-purpose manufacturing facilities to areas where legal systems and economic regulation vary from the normal provisions of the country concerned. Free zones may reduce taxes, customs duties, and regulatory requirements for registration of business. Zones around the world often provide special exemptions from normal immigration procedures and foreign investment restrictions as well as other features. Free zones are intended to foster economic activity and employment that could occur elsewhere. An export-processing zone (EPZ) is a specific type of FTZ, set up generally in developing countries by their governments to promote industrial and commercial exports. According to the World Bank, “an export processing zone is an industrial estate, usually a fenced-in area of 10 to 300 hectares, that specializes in manufacturing for export. It offers firms free trade conditions and a liberal regulatory environment. Its objectives are to attract foreign investors, collaborators, and buyers who can facilitate entry into the world market for some of the economy’s industrial goods, thus generating employment and foreign exchange.” Most FTZs located in developing countries: Brazil, Colombia, India, Indonesia, El Salvador, China, the Philippines, Malaysia, Bangladesh, Nigeria, Pakistan, Mexico, Dominican Republic, Costa Rica, Honduras, Guatemala, Kenya, Sri Lanka, Mauritius and Madagascar have EPZ programs. In 1997, 93 countries had set up export processing zones employing 22.5 million people, and five years later, in 2003, EPZs in 116 countries employed 43 million people. The world’s first documented free-trade zone was established on the Greek Island of Delos in 166 BCE. It lasted until about 69 BCE when the island was overrun by pirates. The Romans had many civitas libera, or free cities, some of which could coin money, establish their own laws, and not pay an annual tribute to the Roman Emperor. These continued through at least the first millennium CE. In the 12th century the Hanseatic League began operating in Northern Europe, and established trading colonies throughout Europe. These Free Trade Zones included Hamburg, and the Steelyard in London. The Steelyard, like other Hansa stations, was a separate walled community with its own warehouses on the river, its own weighing house, chapel, counting houses and residential quarters. In 1988 remains of the former Hanseatic trading house, once the largest medieval trading complex in Britain, were uncovered by archaeologists during maintenance work on Cannon Street Station. Shannon, Ireland (Shannon Free Zone) established in 1959 has claimed to be the first “modern” free trade zone. The Shannon Zone was started to help the city airport adjust to a radical change in aircraft technology that permitted longer range aircraft to skip a required refueling stops at Shannon. It was an attempt by the Irish Government to maintain employment around the airport and for the airport to continue generating revenue for the Irish economy. It was hugely successful, and is still in operation today. Other free zones of note are the in India, which started about 1960, and the in Taiwan which started in 1967. The number of worldwide free-trade zones proliferated in the late 20th century. Corporations setting up in a zone may be given a number of regulatory and fiscal incentives such as the right to establish a business, the right to import parts and equipment without duty, the right to keep and use foreign exchange earnings, and sometimes income or property tax breaks as an incentive. There may also be other incentives relating the methods of customs control and filing requirements. The rationale is that the zones will attract investment and create employment and thus reduce poverty and unemployment, stimulating the area’s economy. These zones are often used by multinational corporations to set up factories to produce goods (such as clothing, shoes, and electronics). In the US, the is led by the Secretary of Commerce and the Secretary of the Treasury. In January 2009, the Foreign-Trade Zones Board adopted a FTZ Board staff proposal to make what it called the (ASF) as a means of designating and managing general-purpose FTZ sites through reorganization. The ASF provides Foreign-Trade Zone Grantees with greater flexibility to meet specific requests for zone status by utilizing the minor boundary modification process. The theory of the ASF is that by more closely linking the amount of FTZ designated space to the amount of space activated with Customs and Border Protection, Zone users would have better and quicker access to benefits. When a FTZ Grantee evaluates whether or not to expand its FTZ project in order to improve the ease in which the Zone may be utilized by existing companies, as well as how it attracts new prospective companies, the Alternative Site Framework (ASF) should be considered. The ASF may be an appropriate option for certain Foreign-Trade Zone projects, but the decision of whether to adopt the new framework and what the configuration of the sites should be will require careful analysis and planning. Regardless of the choice to expand the FTZ project, the sites should be selected and the application should be drafted in such a manner as to receive swift approval, while maximizing benefit to those that locate in the Zone. Successful zone projects are generally the result of a plan developed and implemented by individuals that understand all aspects of the FTZ program. Sometimes the domestic government pays part of the initial cost of factory setup, loosens environmental protections and rules regarding negligence and the treatment of workers, and promises not to ask payment of taxes for the next few years. When the years are over, the corporation that set up the factory without fully assuming its costs is often able to set up operations elsewhere for less expense than the taxes to be paid, giving it leverage to take the host government to the bargaining table with more demands, but parent companies in the United States are rarely held accountable. ^ “Free-trade zone”, Encyclopædia Britannica. Retrieved 28 August 2016. ^ a b Sargent, John; Matthews, Linda. “China vs. Mexico in the Global EPZ Industry: Maquiladoras, FDI Quality and Plant Mortality” (PDF). University of Texas Pan America. Archived from the original (PDF) on 2010-07-16. Retrieved 2009-11-11. ^ “Compare”. Yusen Logistics Co., Ltd. Retrieved 9 May 2014. ^ “Welcome to Shannon Development”. ^ “Syria, Jordan open a free trade zone”. Hürriyet Daily News. Retrieved 2017-01-06. ^ “Foreign-Trade Zone Alternative Site Framework (ASF)”. Foreign Trade Zone Corporation. Retrieved April 1, 2013. ^ “81b. Establishment of zones”. Retrieved 10 April 2013. ^ Millen, Joyce; Holtz, Timothy (2007). “Dying for Growth”, in The Politics of Globalization: A Reader at Google Books, ed. Mark Kesselman. Houghton Mifflin.